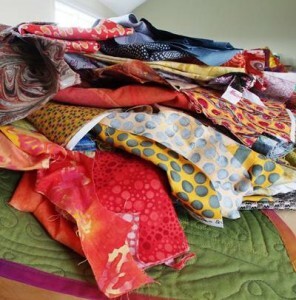 We have had a large fabric donation of primarily dress-making fabrics. At the September meeting, we are replacing the usual trading table with a MASSIVE collection of fabrics from scraps to 9 metre pieces! Thanks to Mary Phillips, Barbara Slater, Delma Calcagno and Jann Haggart for taking their Sunday to pick up four carloads of fabric. The Sew, Art and Chat group spent their Sunday sorting and packaging all of the fabric to sell. It is an impressive collection and I hope you all bring your extra cash to pick up a piece or two. There are silks, satins, wools, polyesters, twills, crepes, it goes on and on. The sale table will be located where the library usually sits and the library will be sitting in the book room this month. This will give Mandy a larger area to spread out. Why not grab yourself a bargain?